The City Palace of Alwar is known as the Vinay Vilas Mahal. It is standing huge in the heart of Alwar City of Rajasthan. The City Palace, of Alwar, was built up by Raja Bakhtayar Singh in the year 1793. The building is a perfect example of Indo-Islamic architecture. The prehistoric city of Alwar is settled at the slopes of the Aravalli Hills has converted into a crowded trade center in recent times. But its rich history has left many examples through many temples, forts, tombs, gardens and palaces. Alwar is one of the oldest cities of Rajasthan and ii has always been a favorite place for the archaeologists. 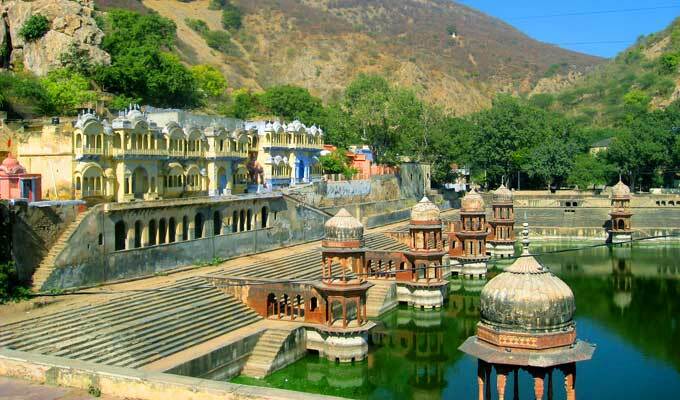 The Alwar city is settled in the year past 1500BC. It is also called Matsya Desh as Pandavas had spent thirteen years at this place. Alwar is the best place where you can take a relaxed walk through the many forts and tombs that depict the picture of olden times. Built by Raja Bakhtayar Singh in the year 1793, Vinay Vilas Mahal depicts the architectural beauty of the bygone era. The monument of the Alwar Vinay Vilas Mahal gives you a perfect example of the Indo-Islamic architecture. It is a huge monument, which can be entered through an entrance with projecting balconies on either side. Jai Pol, Suraj Pol, Laxman Pol, Chand Pol, Kishan Pol and Andheri Gate are some of the entry gates. Beyond the gate lies an open ground with Krishna temples on all four sides. The City Palace, Sagar, which is known as a tank, and Moosi Rani ki Chhatri are located just behind these temples. The splendor palace of the palace is well-known for its beautiful architecture and decoration of late 18th century. A part of the complex houses the museum where a rich part of its history has been preserved. In the golden Durbar Hall at the City Palace, there is a raised platform upon which rests a gold and velvet throne.On the walls and ceiling of the palace, there is a fabulous collection of murals and mirror work can be seen. The City Museum, located on the upper floors of the Palace has a splendid range of miniature paintings of the Alwar School. The colors in the paintings are as fresh and lively as ever. In the museum, there is the rare silver table which used to interest the dignity of the Rajera and also the vast collection of the armory is an example of the Royals and the style. The City Palace of Alwar is now the house for government officials. The museum inside the city palace Alwar is known by the name of Government Museum Alwar which was established in 1940. The collections on the display are the artifacts of the royal family of the palace which includes about 9702 coins, 2270 arms & weapons, 234 sculptures, 35 metal objects, 2565 paintings & manuscripts and much more.